Ken Stanbury had to time it well as he hit back from 15-5 down to take the Portsmouth & District League singles title. It was a busy weekend of action with the bowlers competing in semi-finals at Milton Park and finals at Rowner. Gosport bowler Stanbury didn't adjust so well to the green and his rival Milton Park’s Mick Molloy took charge going 15-5 up by the 10th end. But the contest soon switched in momentum. Stanbury kept his cool and 10 ends later he had wrapped up a 21-17 success. 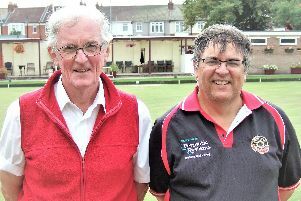 The beaten semi-finalists were Andy McKain and Geoff Anderson. In the men's over 60s singles it was a different story for Anderson as he won the prize. He also had to fightback, coming from 11-6 down to Alexandra’s Steve Feilder to get the prize 21-14. In the last four Anderson beat Derek Holt, while Feilder had seen off Simon Filippi. The men’s pairs final saw the defending champions Steve Feilder and Paul Lawrence lose 19-15 to Simon Filippi and Russell Durham. A fast start from Fareham’s Sue Wheeler and Dorian Bishop saw them win the mixed pairs final. They moved ahead 17-0 after just five ends. Rivals Linda Maple (Fareham) and Andy McKain (Milton Park) did rally and respond well but they still eventually lost 26-13. The men’s fours title went to Southsea Waverley’s Billy McCubbin, Phil Drewball, Ollie Mew and John Biggs. They won 25-11 against Leigh Park battlers John Blandford, Peter Nicklen, Nathan Hanley and Lewis Voysey. Waverley won a dramatic semi-final with Priory. They fell 19-6 down before hitting back to lead 24-19. Priory responded with a four but Waverley won it 25-23. 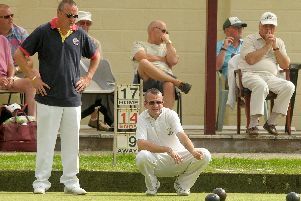 The Ivan Robb Memorial final was between Waterlooville’s Derek Holt and Cowplain’s Dave Wildman. A three on the final end ensured it was Holt who took the title 21-17. The mixed triples final saw Adrian Snook, Tracy and Andrew Hibberd earn a 22-10 victory over Fareham’s Mandy Young, Richard Horler and Cyril Friend. Cowplain’s David Palmer, Wendy Brown, Jane Franklin and Bryan Franklin won the mixed fours. In the final they beat Tania, Sue, Jim and Jamie Ward, who were representing Leigh Park. The Cowplain quartet (with Dan Palmer replacing Bryan Franklin) beat Fareham’s Vic Bennett, Gina Pindar, Sue Wheeler and Dorian Bishop 28-13 in the semi-final.